There is an indoor Piterland aquapark in St Petersburg. 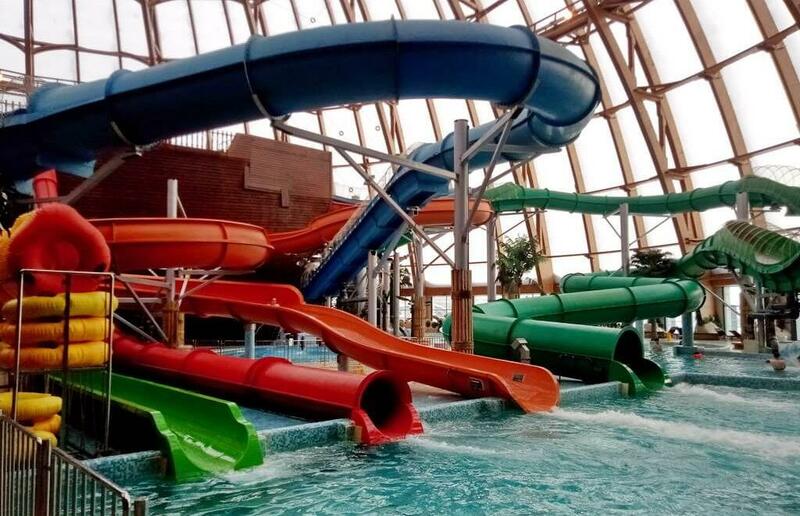 It is the biggest water park in Russia. In this article, we guide you through its entertainments and give some recommendations on how to get here and some information on prices. In the Piterland water park, you can buy tickets for the whole day and for 5 hours. – 5 hours – 1,200 roubles on weekdays; 1,500 roubles on Saturdays, Sundays, and holidays. A charge for every extra 15 minutes after 5 hours is 100 roubles. – all day – 1,500 roubles on weekdays; 1,700 roubles on Saturdays, Sundays, and holidays. — all day – 800 roubles on weekdays; 900 roubles on Saturdays, Sundays, and holidays. For children under 5 years old, admission to the water park is free. Important rule: when visiting the water park, children under 18 years old must be accompanied by an adult! We recommend you to take an all-day ticket. The price doesn’t differ much, but you will not have to mind the time and fuss. Time flies in the water park! 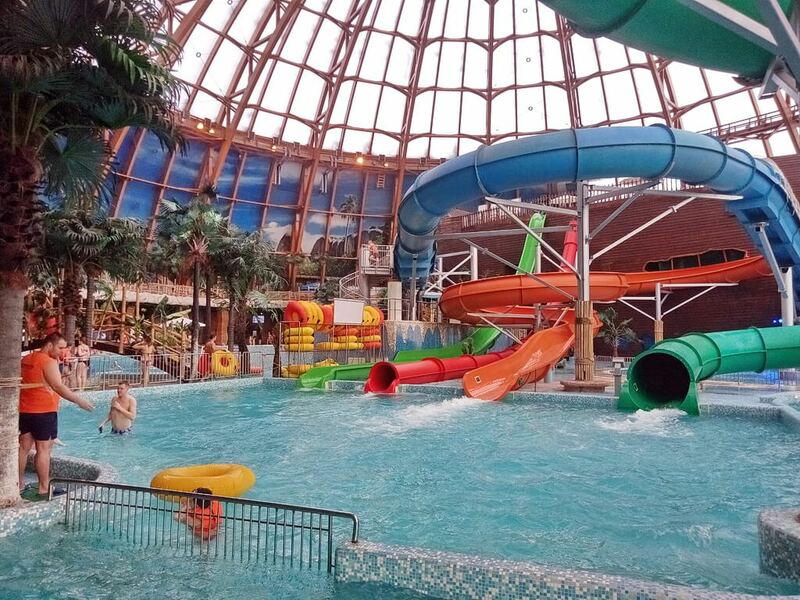 However, in our opinion, 5 hours in the Piterland aquapark will be quite enough for the first visit. To store the most valuable things you can rent a safe, which is located right at the entrance under the constant supervision of security. The rent cost of a small safe in Piterland is 100 roubles, that of a large one is 150 roubles. You can rent a small or a large family locker room, not to huddle up in a small free section, where only two adults can change clothes simultaneously. 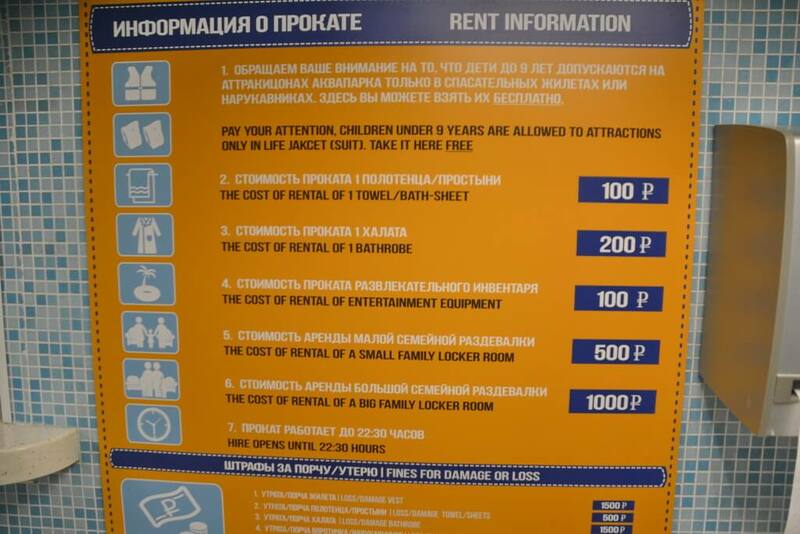 A small family locker room costs 500 roubles, a large one – 1,000 roubles. Towels/sheets and bathrobes are also available for rent. 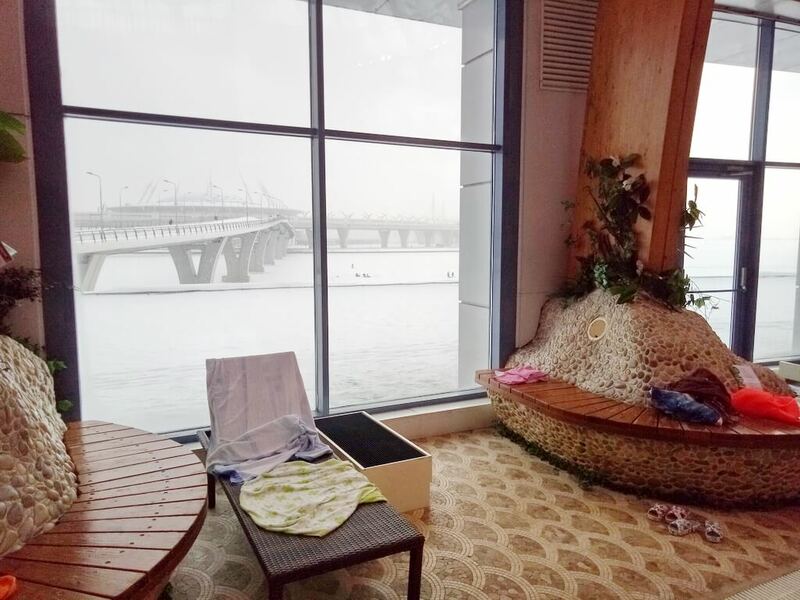 A towel/sheet can be rented for 100 roubles, a bathrobe – for 200 roubles. The rental desk is located between the showers and entry to the water park, i.e. you will see it anyway. In addition, there you can (or rather should) take free waterwings or life vests for children under 9 years. — by marshrutka from the Staraya Derevnya and the Chernaya Rechka (Black River) subway stations. The easiest, fastest, and optimal route lies via the Begovaya subway station, opened in May 2018. The station has an exit to the Savushkina street (ulitsa), where you turn right and go to the intersection with the Yakhtennaya street (ulitsa), then turn right (without crossing the street), and go to the destination point. The water park can be easily identified by the dome. The walk will take about 15 minutes. 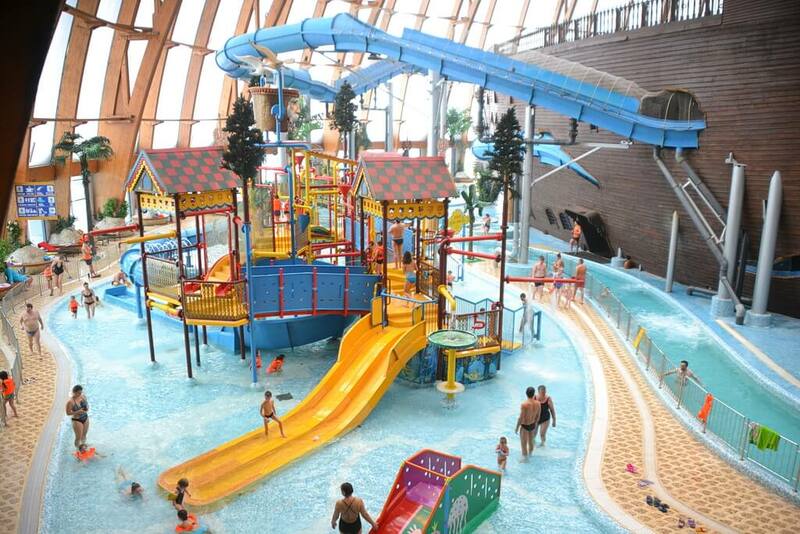 Being the biggest water park, Piterland is very popular, so there are always people there. Before you get a magnetic bracelet that will give you access inside, you will most likely have to wait in a queue. On weekdays, of course, it is smaller than on weekends. About locker rooms in the Piterland: locker rooms are not divided into male and female. There is one zone with dressing rooms, as on the beach. They are not very large, can accommodate two adults, but there is enough space to change. Take all toiletries from home, because you will be given nothing but the bracelet. In the water section there are many sun loungers where you can leave your towel and flip-flops, just like on the equipped beach. However, sun loungers and benches are not only «on the beach». You will find them almost everywhere (see photo below). 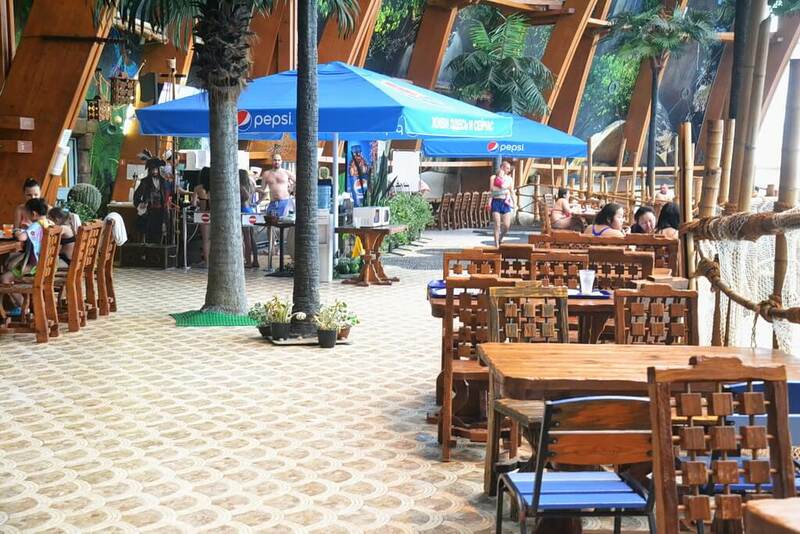 In the water park, we recommend using flip-flops – the tile is rather slippery because of water. There are also less slippery rough surfaces, but you should still be careful. The temperature of water and air is very comfortable, but, for example, at the entrance to the water zone or the bath complex there is a draught that brings goose pimples rising. The water in the child sector is very warm, even hot. The child pool is shallow, and parents can lounge in the warm water, while their children frolic in the pool with waterslides. Let us remind you once again that children under 9 years old must wear vests or sleeves, which are given free of charge at the rental desk. In general, the capacity of Piterland is about 2,000 people, but when the amount of visitors exceeds 700, it becomes somehow cramped, i.e. it is problematic to find a free sun lounger and there appear queues to waterslides. The best number of visitors is 350-400 – it is neither deserted, nor cramped. Piterland is well-arranged. In the center of a huge circle, which is the water zone, there is the central pool and a ship in the style of the «Black Pearl» («Pirates of the Caribbean»), which is the basis for waterslides. The pool and the ship are bordered by a «slow river», i.e. a pool in the style of a «road» with warm water where you can safely swim or walk. To the left of the ship there is a child zone, to the right – a pool for divers and a bath complex. On the second floor there is a cafe. The tropical atmosphere is created by palm trees and other plants. The child zone is a set of waterslides and small pools. 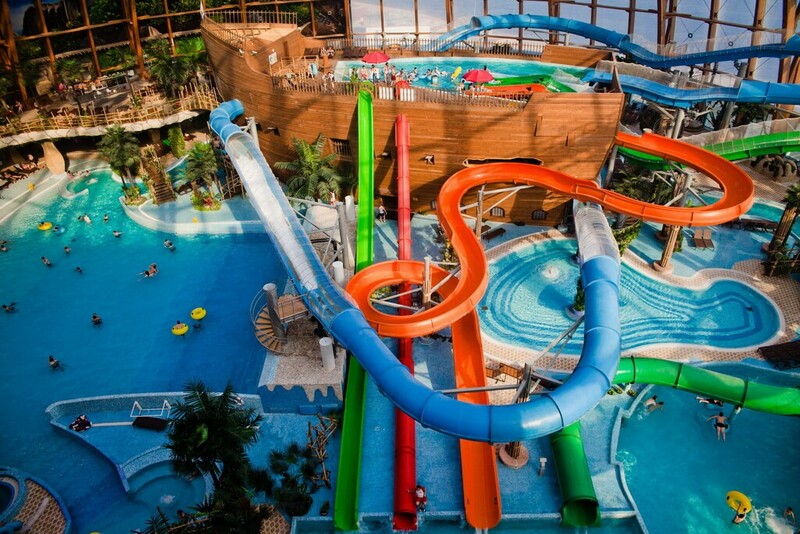 There are five waterslides in Piterland. Visitors should use special sledges to ride blue, green and orange waterslides and just lie on their back to ride the other two slides. The most popular are blue and green slides, they are both covered. Note: to ride one of them, you need to get a sledge, which can be found in the water park. Usually sledges are not lying here and there. To get it, you need to wait in a queue, which can be very long. There are also queues on slides, sometimes they begin on the stairs. There are also some special mini-attractions for extra fee: zorb water balloons, boats. A zorb water balloon is a hollow transparent ball into which a person gets and then rolls, more precisely, tumbles in the ball on the water. It costs about 300 roubles and it will be interesting to small visitors. Adults, perhaps, will prefer fish-peeling: one lowers his feet into an aquarium, and small fish in it «collect» dead skin from them, while not affecting healthy cells. Entertainment is not cheap – 500 roubles for 5 minutes, but the feeling is unforgettable. In addition, water polo games are held in the same pool at regular intervals. At least eight people older than 15 years are needed for the game. 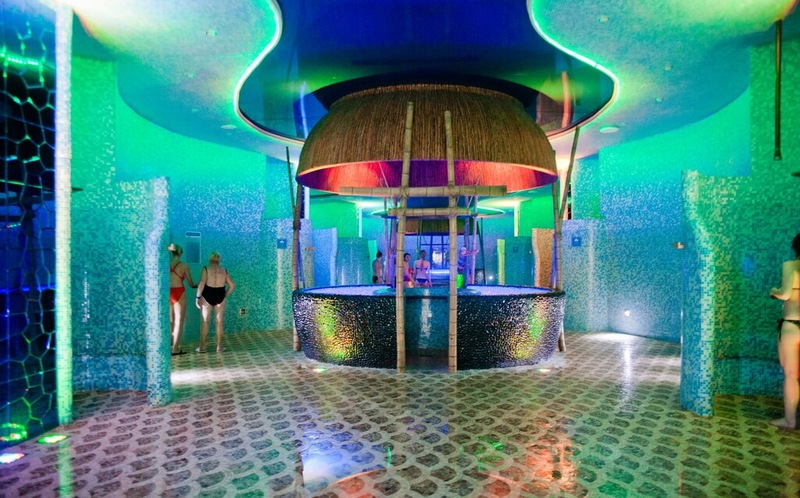 A place where you can relax and feel refreshment of mind and body is the bath complex in Piterland – huge, consisting of as many as 12 rooms and saunas, each designed in its individual style. Near the door to each sauna there is a sign with temperature and humidity inside, as well as contraindications to visiting it. Only a couple of saunas, namely Russian and Finnish, have more or less serious temperature, while in the rest it is just warm. In the Japanese sauna, the floor and shelves are stone-covered, so people often do not sit, but lie on them, warming up their back. 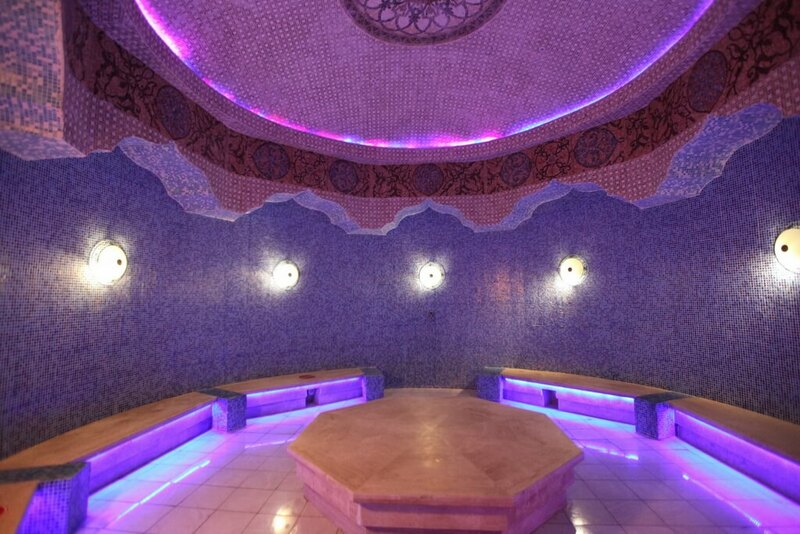 The same thing, only without the stones, can be seen in the African sauna. In the Finnish one, by tradition, it is very hot and very dry. In the Roman and Turkish ones, there is a veil of steam, through which almost nothing is visible, as in thermaes or hammams. It is just very hot in the Russian sauna, just like in banya. There is a bar and a bistro in the Piterland water park. The range is standard: pizza, hot dogs, salads, hot dishes; drinks: juices, lemonades, cocktails. To have a normal meal, you need to pay 400-500 roubles. We will name some prices (actual for September 2018): a hamburger – 200 roubles, a hot dog – 110, «Vitamin» salad – 180, cream soup or borscht – 180, juice and compote 0.4 l. – 100, juice 0.2 l. – 50 roubles.